Close to a year ago, city officials, dignitaries, and even the Cass Tech High School marching band held this grand party at Grand Circus Park in downtown Detroit for the launch of the QLine: a streetcar that would cruise up the city’s most famous corridor, Woodward Avenue, with a top speed of 35 mph. It was supposed to be the streetcar that everyone in Detroit desired. Those dreams were derailed when a report came out that QLine ridership did not reach its intended goal. According to the report, M-1 rail officials expected the QLine to average 5,000 riders between September 5, 2017-September 5, 2018, the first full year of riders having to pay. Riders enjoyed a summer of free fares following its May 2017 debut, thanks to a generous donation by the Kresge Foundation that allowed riders to free up until Labor Day. From its inception in May to October 2017, ridership averaged 4,660 rides daily rides. Once riders had to pay, they stopped riding. Ridership dropped to 3,700 daily riders and when the temperatures plunged during the winter months between November and March, so did the riders, with an average of 2,700 daily. The QLine has had low ridership numbers in its first year because it limits riders to downtown and Midtown Detroit. The 3.3-mile long ride starts in the heart of downtown near Campus Martius and literally stops on Woodward and the Boulevard, just before the North End neighborhood of Detroit begins. I am not saying the QLine does not serve a purpose, its purpose is just not serving Detroiters who use public transportation to get around. It only serves those who either work, live, are exploring, or attending functions in the downtown and Midtown areas. The lack of mass transit in the metro Detroit area has been a main topic of discussion for decades and the QLine does not help to solve any of the problems, such as providing rapid service to the suburbs where a lot of Detroiters work and go to school, or anywhere else in the city everyday residents need to reach. If it were to travel up Woodward all the way to Eight Mile Road, it would attract more riders. Unfortunately, its purpose was not to serve the neighborhoods of Detroit. The QLine is privately funded and instead of it being inclusive, it is exclusive. So exclusive, that you have to drive your car or ride a bus just to be able to ride it. To most, it defeats the purpose of using it. The QLine should also be free. It costs $1.50 to ride for unlimited rides within three hours and $3 for a 24-hour pass. The Detroit Department of Transportation Woodward 53 bus costs the same and will take you further and faster. For $2.00, you can take a variety of Woodard SMART buses even further than what the DDOT buses will take you. There is a reason why ridership dropped once riders had to pay: the QLine is not useful for majority of Detroit. It was going through the honeymoon stage and people were enamored with having a streetcar in Detroit for the first time in over 60 years. Other problems with the QLine it being too slow, not having a dedicated middle lane to run on, waiting times because trains have either broken down or are being blocked by parked cars, and the excessive fines for those who do not have fare. I had to walk from Grand Circus Park to Woodward and Canfield because the QLine had an estimated wait of 25 minutes and I still beat it to the Hop Cat restaurant next to the David Whitney Mansion. Officials say ridership will get better, but I am not a believer. If the length of the QLine does not increase, or the fare reduced, it will continue to only cater to those from the suburbs coming to enjoy downtown and Midtown. 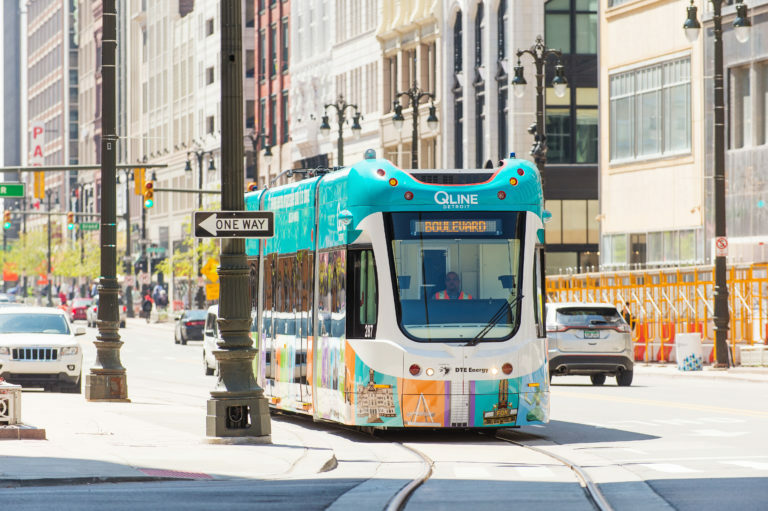 In the report it said, “The QLine is much more than a streetcar and it is much more than a way to get from one place to another. The QLine is a roadmap to what’s possible when people are connected.” But who exactly are they trying to connect?